Stars: Tom Cruise, Henry Cavill, Ving Rhames, Simon Pegg, Rebecca Ferguson, Sean Harris, Alec Baldwin, Angela Bassett, Michelle Monaghan. In the first of the series to actually follow on from the events of the previous movie, Ethan Hunt (Tom Cruise) and his team have to pull off another daring raid after a mission to intercept some plutonium destined for the hands of a syndicate of terrorists, known as “The Apostles”, is unsuccessful and the plutonium slips through their grasp. We don’t really need to talk about what Tom Cruise brings to the table. The MI movies are his baby and these movies are, for the most part, what he does best. I think he has come in for some unfair criticism over his career but I’ve always enjoyed his films, again for the most part. His energy and dedication to the Ethan Hunt role cannot be in any way questioned. He always give his best to these movies. The same cannot be said of Henry Cavill, I’m pretty sure he has already been on the end of some harsh words from me already in previous reviews, not least the awful Batman Vs Superman. He’s just awful. He reminds me of an old shelf unit that used to hold some of my VHS collection, sturdy and functional but totally made of wood. It was good to see Rebecca Ferguson & Sean Harris reprise their roles from Rogue Nation, particularly Harris. He’s probably little known to most but he’s been on my radar for some years in plenty of British television. He always makes for an excellent unsavoury character and it was very pleasing to see him back and enjoying a larger chunk of screen time. Back to the negative and Simon Pegg, the way they have developed his character, Benji, just doesn’t fit. He’s not action movie material in terms of being in the field and is much more suited to the geeky tech guy in support but I think this is reflective of Pegg’s somewhat misplaced celebrity status and friends in the right places that his roles are becoming more involved. It’s a shame, I don’t want to be negative about Pegg, I love his earlier comedy work and collaborations with Edgar Wright but I can only review what I watch. I was also a little disappointed that Jeremy Renner was missing in Marvel action as I feel he slots into the team really well. As already mentioned and much like Spectre in the Bond franchise, Fallout is the first MI movie to be an actual sequel to the previous film, in this case Rogue Nation – which was excellent. So it made sense to build on the foundations laid by it. It does this fairly well but Fallout is a much bigger affair. Whilst I thought Rogue Nation was quite cleverly understated Fallout really goes for the jugular. At well over two hours twenty minutes it manages to fill most of it with action, sometimes at the expense of the more intricate plot twists and trickery that previous films had trademarked. 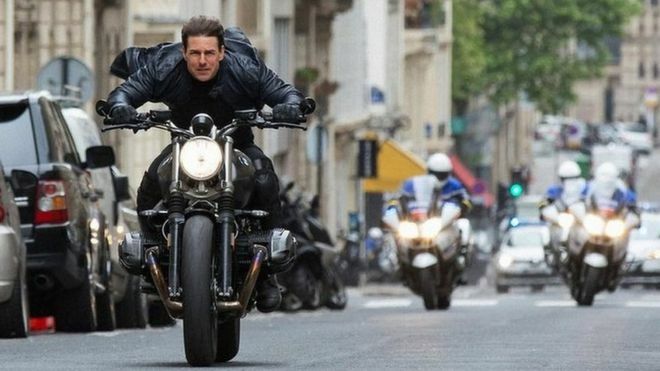 Some of the action is quite breathtaking but it did feel that it went a little over the top the longer it went on and to say that about a Mission Impossible movie is really something. It didn’t spoil it particularly – it could probably just have been condensed down a little. The car chase through Paris is especially worthy of mention but there’s other action sequences that are very pleasing on the eye. One thing it did do, either intentionally or not, was to parody itself and this really didn’t work. Some light moments of humour worked but moments taking the mickey out of your own movie isn’t the best idea for a movie of its type especially if you want to ramp up the tension. The problem for this franchise is it can never win. When it does one thing it gets criticised for not doing something else and when it does something else it still gets criticised. There hasn’t been a terrible movie in this series, only Ghost Protocol weighed in as average. As long as Cruise makes these movies I’ll certainly be interested. Stars: George MacKay, Anya Taylor-Joy, Charlie Heaton, Mia Goth, Matthew Stagg. Fleeing to the United States, four siblings and their Mother look to put the events of the past firmly behind them and begin new lives in a remote manor. It doesn’t take long for the past to catch up with them and, after what was the happiest summer the children had ever had, events take a tragic turn for the worst and shortly afterwards their mother also dies leaving the oldest child, Jack (George MacKay), to keep the death of their Mother secret until his twenty-first birthday and keep the promise to his late mother that the siblings would not be separated. I was very impressed with all of the young cast. George MacKay (11.22.63) led them very well showing a compassionate side towards his sister and two brothers but as he builds a relationship with Allie (Anya Taylor-Joy – Split) he becomes more and more protective of them and his despite his feelings for Allie he keeps the two sides of his life apart. 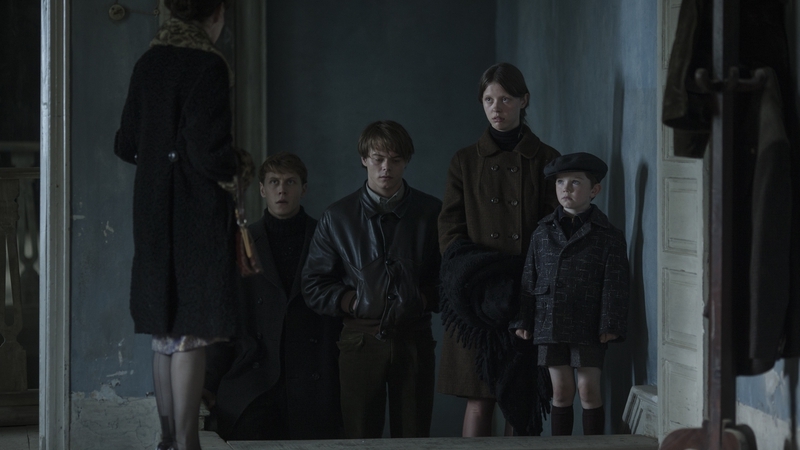 This is much to the behest of second eldest brother Billy (Charlie Heaton – Stranger Things), his frustration at his freedom being limited spills over into shows of anger and impulsive behaviour which Heaton conveys very well. Mia Goth‘s (A Cure For Wellness) role was almost a more maternal one as she tended to the much younger brother Sam (Matthew Stagg) as she home schools him and essentially brings him up after the passing of their mother. Goth shows a very nice bedside manner and also tries to mediate between the family when tempers become frayed, another side she also played with some ease. Anya Taylor-Joy has something of a supporting role here but she just slides through the role effortlessly and again shows she is certainly going places. The Secret of Marrowbone (originally just “Marrowbone”) is not a high pace horror movie so if you’re looking for that sort of thing maybe try The Purge. What it is, is a very well though out character based story of tragedy within a family coupled with some quite sinister overtones. It pays a lot of attention to the building of the characters and letting the viewer into just about every corner of their lives but keeping the most harrowing of secrets until the very end. It’s not a jumpy or scary movie in any form. I did feel that at some points the film spent too much time opening the characters up before anything really developed in terms of the story but when it finally did it all seemed very worthwhile. Whilst the story didn’t go anywhere totally unexpected it also isn’t that obvious where it would end. Set in the late sixties the surroundings of the film certainly seemed to catch the essence of the period and when the movie did venture into the more creepy periods it was well conceived and played out. A more intelligent scary movie. Stars: Benicio Del Toro, Josh Brolin, Isabela Moner. The US government take a move to change their approach to handling the Mexican Drug Cartels by considering them terrorists which would give them unprecedented controls to be able to tackle the problem. They call in Matt Graver (Josh Brolin) to get “dirty” as he puts it and start a war within the cartels themselves. Graver calls in Alejandro (Benicio Del Toro) and gives him the opportunity to get even for the deaths of his family. The film also tells the tale of a young Mexican boy with intentions of becoming a Sicario and these tales naturally cross paths as story unfolds. I think without the distraction of Emily Blunt, Sicario 2 is allowed to build more heavily on the relationship between Alejandro and Graver and how their stories progress from the first film. Brolin is in good form as Graver who relishes another chance to get in amongst the dust and dirt and tackle the rise in drug and people trafficking. He’s still the larger than life character exuding confidence from every orifice possible yet when the time comes is also able to show signs of compassion and a reluctance to follow orders he is equally efficient in doing so. Alejandro, on the other hand, despite being handed the chance to avenge his family shows his more paternal instincts as he is charged with the safety of a drug lord’s daughter. Del Toro rarely disappoints and he certainly doesn’t here with another accomplished turn. There isn’t really a lot of support to speak of in any depth as the film really does centralise on the two male leads. The film relies on the chemistry between the two to really absorb the viewer into the film, although there is a good outing for Isabela Moner as Isabel Reyes, the drug lord’s daughter with which Del Toro has to protect. She plays a bullying teen who is soon affected the horrors of her Father’s life. Sicario 2: Soldado stands exceptionally well on its own, you don’t really need to have seen the first film to be able to watch this even though the story does build on that which has already passed. Despite a lot of the film taking place in open desert areas of land it still feels very claustrophobic, as if the desert was trapping the cast. It is, in parts, quite brutal and provides the sort of explosive action you would expect from a film of this nature. When you have two such excellent leads, particularly Del Toro, you can’t go far wrong in terms of the acting and the story comes at the viewer from two different angles which meet quite tidily in the closing stages. It’s a solid two hours in which I was fully focused and Soldado 2 didn’t allow anything to distract from the movie’s events. It paints a harsh picture of the horrors or people trafficking and the suffering handed out by the hands of mercenaries who will look to profit from these desperate people.